Justice for Iran- 30 June 2016: Iran’s Ministry of Intelligence has intimidated and threatened with arrest the relatives of a baby girl, who have been demanding information on her alleged enforced disappearance. The baby, Golrou Rahemipour, was born in April 1984 while both her parents were detained in Iran’s notorious Evin prison on charges of political activity. Golrou was taken away from her mother only 15 days after her birth, under the pretext of medical examination and was never returned. In September of the same year, her father was executed. Golrou’s aunt, Raheleh Rahemipour, has since been campaigning to get information about the circumstances of her death and burial, or her whereabouts, but the family has been kept in the dark. Instead of cooperation, the authorities have resorted to intimidation and threats of arrest. Under international law, enforced disappearance is regarded as one of the most serious violations of fundamental human rights and an affront to human dignity. Justice for Iran (JFI) was informed about the case only this year and immediately submitted a formal complaint to the UN Working Group on Enforced and Involuntary Disappearances (WGEID), about the lack of investigation in the case. WGEID urged the Iranian government, on June 6, 2016, to investigate the disappearance of both the baby and her father. JFI has learned from credible sources that after the UN’s letter of enquiry was sent to the authorities in Iran, the members of Iranian security apparatus contacted Ms. Rahemipour on multiple occasions, instructing her to turn herself in. When Ms. Rahemipour requested an official subpoena, she was told by the agents that “we can arrest you any time on the street and take you to Evin prison”. Intimidation of relatives of disappeared persons is contrary to the UN rules. WGEID’s protocol requires the government to protect the fundamental rights of “relatives of disappeared persons, witnesses to disappearances or their families, members of organizations of relatives and other non-governmental organizations, human rights defenders, or individuals concerned”. 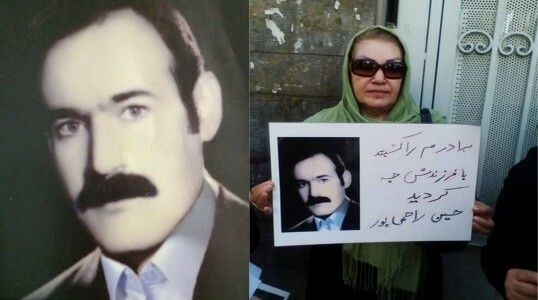 The father of baby Golrou, Hossein Rahemipour, was a dentist and a member of the banned Rah-e- Karegar organization. He was arrested alongside his wife, who was also an activist and pregnant at the time of the arrest. In September 1984, Rahemipour’s family received a phone call from the prison officials stating Hossein was “sent to hell”. The family did not receive his body or information about the circumstances of his alleged execution or burial. JFI will continue to pursue justice and press for investigation into enforced disappearance victims’ cases. Moreover, under the legal definition of relevant information, the date and time of the execution and place of burial should always be made available to the relatives. Lack of such information therewith may constitute ‘enforced disappearance’.